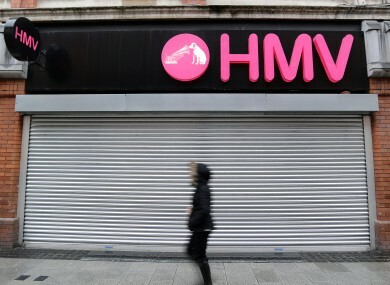 US-BASED RESTRUCTURING firm Hilco has announced that it has agreed to buy the debt of HMV, in a move which effectively hands it control of the collapsed music retailer. When contacted by TheJournal.ie, Deloitte Ireland had no comment to make when asked whether this would have any impact on their receivership of HMV Ireland. Hilco’s British division said in a brief statement that it has taken on debt from HMV’s lenders Lloyds Banking Group and Royal Bank of Scotland, but gave no other details for the transaction. “Hilco UK confirms that it has acquired HMV’s debt from the group’s lenders. It has not bought the business itself,” said the statement. Hilco believes there to be a viable underlying HMV business and will now be working closely with Deloitte who, as administrators, are reviewing the business to determine future options. Last week HMV appointed administrators Deloitte in a bid to help it remain operational, placing about 4,350 jobs at risk after the company had struggled throughout the critical Christmas holiday period. Back in 2011, Hilco bought HMV Canada for approximately €2.4 million in a deal which had allowed parent group HMV to secure a new borrowing facility at the time. Email “US restructuring firm Hilco takes control of HMV in the UK”. Feedback on “US restructuring firm Hilco takes control of HMV in the UK”.